Due to the nature of cable reinforced trapezes (and to a lesser extent, cable reinforced hanging ropes), some users may find that after a certain amount of use, their ropes will start to bunch, or "hockle" just above the bottom splice. This is due to the strength of the trapeze coming from the steel cable that runs through the core of the rope and is permanently welded to the bar at the bottom. This steel rope has no stretch to it. (see fig. 1) This allows cable reinforced apparatus to use a much softer cotton rope as a cover, which makes it much more comfortable to use as a trapeze, however the cotton rope does stretch over time. 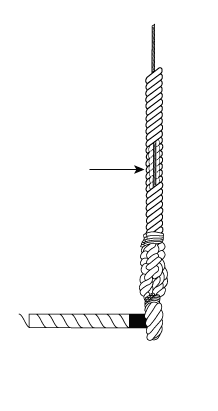 During normal use of the trapeze, the cotton ropes will gradually move down the cable and begin to fatten at the bottom, just above the splice (see fig. 2). This will happen faster if used by people who employ a lot of high rope work in their trapeze routines, and more slowly for those to prefer low rope work or bar work. 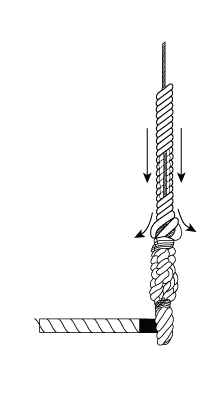 If left unattended for too long, this fattening will lead to a splaying of the rope, which can make it look like the splices are coming undone (see fig. 3). This does not affect the strength of the trapeze, but can look unsightly and exposes the cable core if it progresses too far. 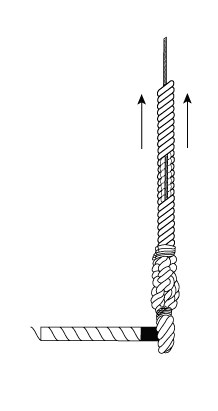 Firetoys recommends that users keep an eye out for any fattening at the base of the ropes during regular inspection, and advises periodically de-rigging the trapeze and pulling the ropes back up the cable when deemed necessary (see fig. 4). This should fix any hockling and help prevent your trapeze ropes from reaching the point where the cable core is visible.